Last year, Rio Grande Volunteer Firefighter Paul Cochran, right, stands with Paul Merryan of Fire Safety Services, left, as they test the fits of breathing masks for firefighting. RIO GRANDE — The Rio Grande Fire Department is seeing some changes with grants and focuses in training. “With the number of cancers that are starting to skyrocket in the fire service, these hoods are designed to reduce some of the particulate matters that cause cancer and everyone got one,” said Hemmerick. The fire department is also processing another Assistance to Firefighters Grant through FEMA and received another $25,000 and are looking to replace most of its fire hose. 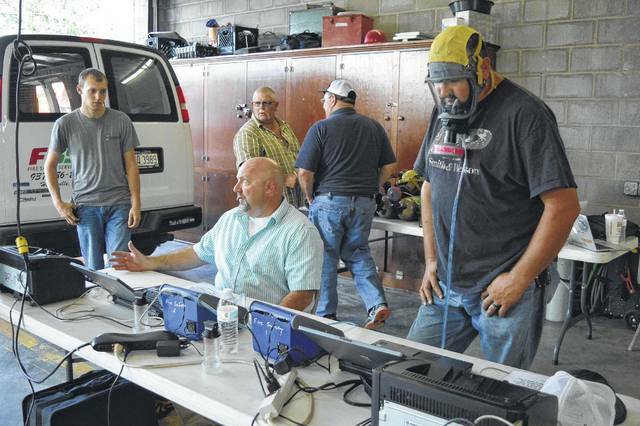 https://www.mydailytribune.com/wp-content/uploads/sites/42/2019/01/web1_DSC_0408.jpgLast year, Rio Grande Volunteer Firefighter Paul Cochran, right, stands with Paul Merryan of Fire Safety Services, left, as they test the fits of breathing masks for firefighting.